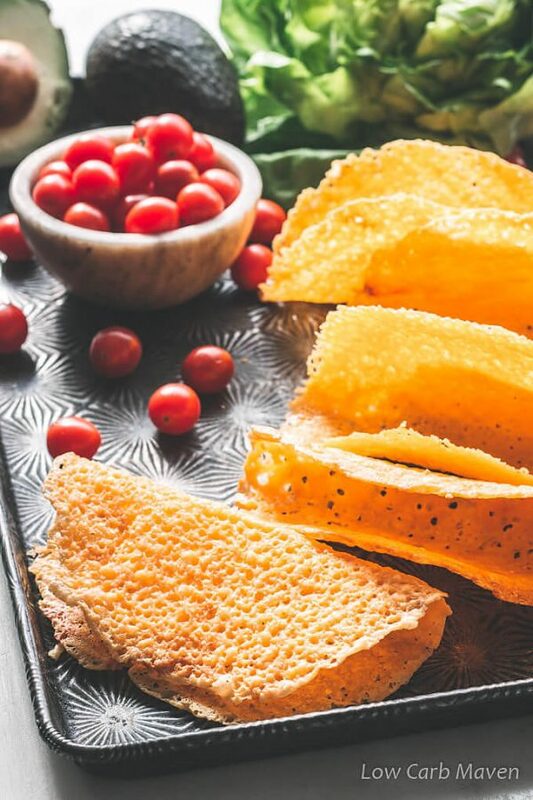 Making crispy cheese taco shells is easier than you think. 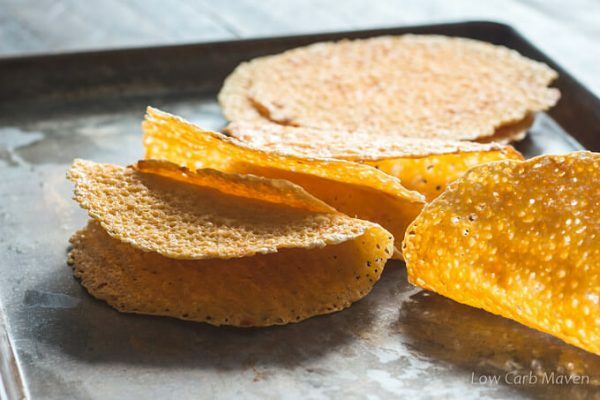 These cheese taco shells are crunchy, delicious and taking the keto world by storm! Gluten-free, too. If you’ve missed eating crunchy tacos like I have, then you are in for a treat. Low carb taco shells made from cheese are the new “in” thing. We’ve baked cheese into cheese chips for dip, taco shells, chalupa or tostada shells and bowls for salads or appetizers. They are very versatile and my family loves them. Looking to make low carb beef tacos? 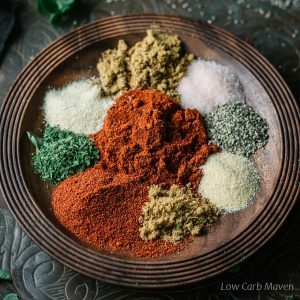 Take a peek at my recipe for low carb taco seasoning and then see how I make the BEST tasting ground beef taco filling. It’s super easy. A Google search for low carb tortilla recipes yields many options for crepe-like and wrap-like tortillas. My recipe for Almost Zero Carb Wraps, which we use as breakfast wraps or fill with thick Southwestern stews, is right there on page 1. 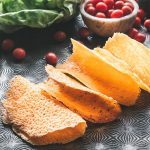 Crunchy low carb keto taco shells recipes have been elusive… until a year or two ago, when cheese taco shells made their appearance. 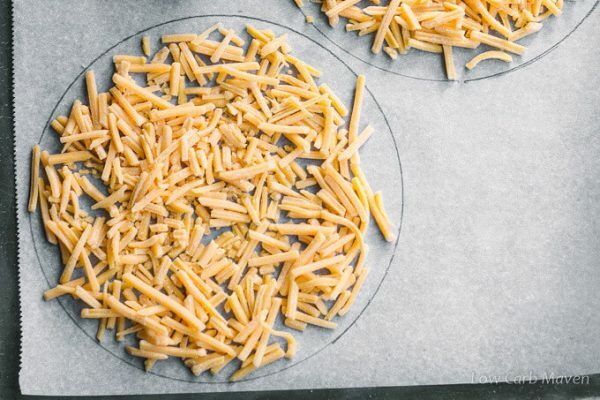 Lowcarbers and Ketonians have used cheese to make chips for years now, so making them bigger to accommodate fillings is just a natural progression – and genius! I get a kick out of all of the possibilities these fun snacks provide. All kinds of cheeses can be used to make cheese taco shells and they all have different flavors and levels of crispness. Some yield a cheese shell that is more crisp while others are a little more tough in texture. The shells can be made with shredded cheese or cheese slices. They can also be made in the oven, on the stove or in the microwave. Celiacs: If you are looking for gluten-free taco shells, this may be the recipe for you. Make sure that the pre-shredded cheese you use, is free from gluten and you will be fine. Do low carb taco shells have carbs? Yes, a small amount of carbs comes from the lactose in cheese. Most cheese has 1 carb per ounce. Many brands will list zero carbs because of FDA rules that say if a product is below 1 carb per serving it can be listed as zero even if it has .8 carbs. So, I generally count 1 ounce of cheese as 1 carb. The cheese taco shells are 1 carb per shell. Once cooked, give the cheese shells just a second to cool before removing, but work fast! They need to be shaped while still pliable. Simply drape them over a wooden spoon or dowel until the cool and are crispy. 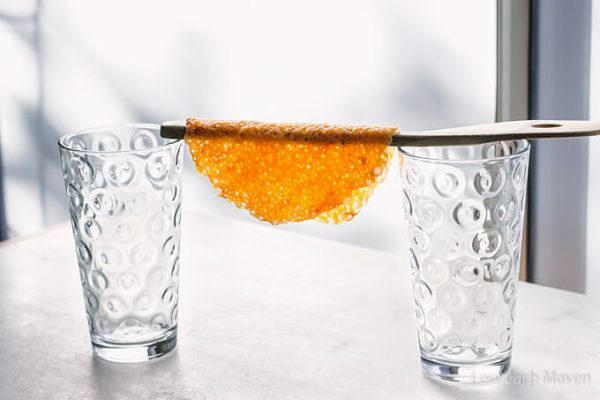 They can also be stuffed into a muffin tin cup to make into a bowl for appetizers. For chalupa or tostada shells and chips, simply let cool on the baking pan, then cool completely on a cooling rack before storing in an air-tight container. Recently, I have been using a taco shell maker for making cheese taco shells. I think it’s much easier than using wooden spoons. I tried several kinds of cheese and found that pre-shredded cheddar cheese from the grocery worked the absolute best. Also, the sharp variety became more crispy than the mild. Monterey jack and Colby jack cheese didn’t get as crispy but also worked well. Parmesan cheese made delicious chips which we enjoyed on our salads. Each cheese taco shell is 1 carb. 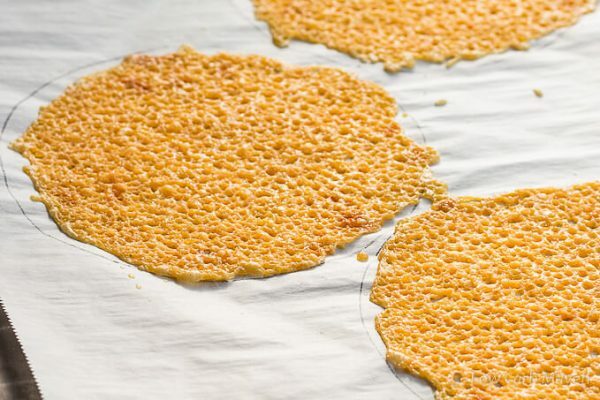 Making crispy cheese taco shells is easier than you think. 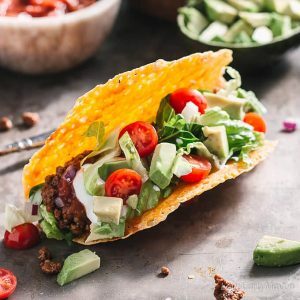 These low carb taco shells are crunchy, delicious and taking the keto world by storm! Preheat the oven to 375 degrees F and place one rack in the upper third and the other rack in the lower third. Line two large jelly roll pans with parchment paper. I like to trace 3, 6-inch circles on each parchment, flipping it over, so my shells are the same size. Measure 1/3 cup (1 1/2 ounces) of shredded cheese per circle and spread evenly. Bake for 5 minutes and swap the lower backing sheets and bake another 5-10 minutes or until little holes have appeared in the surface and the edges begin to brown. Remove from the oven and let cool for just a second before removing to wooden spoons or spatulas suspended by glasses to shape taco shells. Leave on the pans to cool flat for chalupa or tostada shells. NOTE: When I make my taco meat for my family, I add 2 tbsp of tomato paste, 1/2 cup of water and 1 tsp of beef base to the ground beef and taco seasoning. Simmer until most of the liquid is absorbed. Adjust final seasoning with salt and pepper. If it is more bitter than you like (some pepper varieties are more bitter than others) add a touch of sweetener. To make a single serve cheese taco shell in the microwave, spread 1/3 cup of cheddar cheese into a circle (see photos in post) and microwave for approximately 2 minutes. This will take more or less time depending on the strength of your microwave. My microwave is not very strong. Tonight I prepared the taco shells and made up some taco seasoning. I probably used too much cheese since my shells did not hold shape. Also, I used regular cheddar rather that low fat. I live in a rural “food desert” where the nearest grocery of reasonable variety is 40 miles away. despite the lack of form the shells were delicious and snuggly held the taco fixings. The seasoning blend was just right for our taste preference. I will pass both recipes along to the Optavia community. We are trying to eat only Keto, so tried these today. I was skeptical about how they would work, but they are wonderful!! It was so easy, and wuick. Thank you so much for helping us with our journey. Highly recommend!! These are fantastic!! I used a blend of Monterey Jack, Colby and Cheddar Kraft crumbles along with shredded cheddar. I love these. 11 minutes in my 375° oven. I just drape mine over a large metal cooking spoon. The handle is flat so it gives me a small, flat bottomed shell. Perfect for holding the ingredients. Now I have chips for my Chipotle bowl and about 5 other dinner options with these. These directions are so awesome! How long will they keep in the fridge? I want to make some for a party and I need to make a lot. Great and easy recipe!! I used a muffin pan turned upside down to creat ‘taco shells ‘used parchment paper in between shells and muffin cups. Worked awesome!! Looking forward to trying more recipes! I wonder if you can make enchilada shells the same way? Read the label carefully on any shredded cheese package. Most have potato starch, rice starch or cornstarch as a filler to keep the cheese from clumping. Those cause gut pain or elevated blood sugar in many people. I know from my own bad experience with packaged shredded cheese. The reason why packaged grated cheese works best is because all that stuff has wood pulp in it “cellulose” and I don’t eat wood in my cheese. Today is national taco day so I had to make tacos without the usual corn taco shells. I found your recipe and thought I’d give it a try. I shredded my own cheese and I also added in a couple tablespoons of finely crushed pork rind to give it some extra crunch. It worked amazingly well. I used the parchment paper/oven approach using a small plate to make circles to define the edges of the taco disc. I loaded up the tacos with the usual fillings of meat, shredded lettuce, avocado, sour cream and diced tomatoes. Amazing ! So my husband and I said OMG! We made grilled steak tacos. I made the shells-so easy! !i made some guacamole and used sour cream to keep a leaf of Romain lettuce on the inside of the shell. It kept it from falling apart and all the stuff falling out! Will so be making my it with and even an Italian twist!! Did you try using the metal taco shaper? I had that idea before I found this recipe and your comment that you were going to try the taco shaper. Just curious to see if the taco shaper worked before I purchased them. I was also on eBay looking for taco shapers before I found your recipe etc. How ironic!! I have been making your taco seasoning and love it. Sometimes I just sprinkle it on warm chicken…yum!!! Oi will try your cheese taco shell and enchilada sauce next! These are awesome! Made them today super easy! Thanks for sharing this recipe. Amazing thank you! I was craving something crispy and this was perfect. I followed the instructions exactly and came out perfect. Only note is to move very quickly when removing from parchment paper to mold or bend before the cheese sets hard. 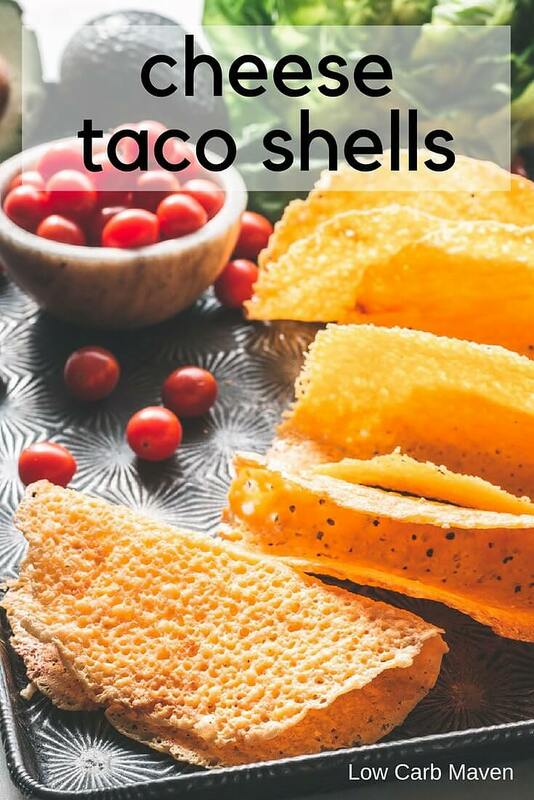 Other than that, perfect crispy taco shells! Can you make these ahead of time? If yes, how is it best to store them? So 2 shells side-by-side on a paper towel with the next paper towel with 2 shells wrapped around that… They don’t stick to the paper towels because they’re naturally oily. These were delicious! I bent some using the wooden spoon method and some cooled flat. Next time we will cool them flat only. Since they are made of cheese, they easily bend when adding warm filling, so the flat ones just nicely folded over. I would only use with warm, not hot, filling. If the cheese gets too hot it stretches out and can collapse beneath the taco. We love these!! So easy! I draped over wooden handles and put newspapers down to catch the few oil drips from the cheese. Hi I cant seem to get these to be crispy, what can I be doing wrong? I am having the same problem. Using sharp cheddar shredded and using both oven at 400 for 5 to 10 min and microwave 55 seconds. Any suggestions… not getting as crispy as I would like. Does the Cheese Shell melt when you put the meat and other taco fixings into it? I love a Crunch with my tacos and soooo miss it! Thinking of making these tonight! Rather than use a wooden spoon, I’d recommend using a short piece of 1/2″ PVC pipe with wax paper over it for cooling/shaping the taco shells. I make cheese taco shells by draping them over the side of a large bowl after the cheese has baked. You do have to work quickly with these! Thank you for all of your delicious recipes. How do you store these if you don’t eat them all? How long will they keep usually?